It was nearly a life-or-death situation nabbing a photo of Carla's splendid polka-dotted ensemble since we had to physically chase her into traffic on Bedford, so speedy was she, wearing her shiny white converse. 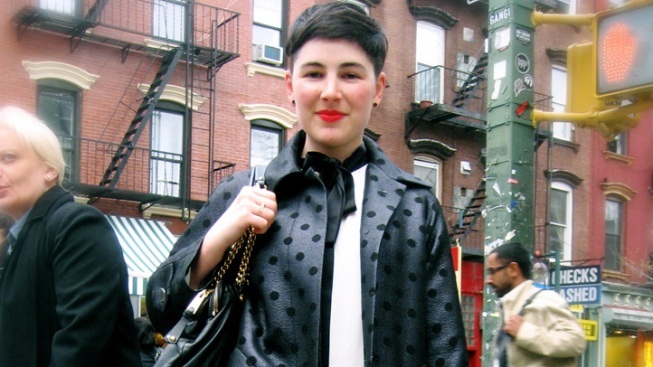 After nearly an hour lurking by the L train stop, it was Carla's coat that caught our eye as it emerged from the staircase: a graphite gray slicker with slight sheen and contrasting matte-black polka dots—luxury loot, we soon learned, from Carla's job at Marc Jacobs, from which she was headed home. Naturally, her gorgeous quilted leather handbag and bow-tie top were also Jacobs' creations. Her fabulous printed pants, however, were a thrift store score. "Vintage Liz Claiborne," she laughs. "Honestly, when I'm not getting something from work, I'm probably finding it at Good Will or Housing Works." Of course, it was the details of her ensemble—a ruby red lip, black stud earrings and a short, razor-sharp haircut—that pulled the whole package together. As for her personal style inspiration, Carla immediately mentioned daring ladies like Anna Dello Russo and Daphne Guiness. "They're both really bold and crazy," says Carla. We sense a kindred spirit in this polka-dotted Williamsburger, who single-handedly inspired us to visit the Good Will located not fifty feet away upon parting.